Fourteen-year-old Ava is thrilled when she lands a part in a play based on the true story of orphans sent to Canada in the 1800s to work on farms. But is she good enough to hold her own in a professional production? As the rehearsal pressures crank up, Ava struggles with her character, with the vocal demands of outdoor theater and with the annoying ego of her castmate Kiefer. But as she learns more about the historical Lily on which her part is based, things begin to fall into place. Then one bad decision jeopardizes Ava's chances of being able to perform on opening night. 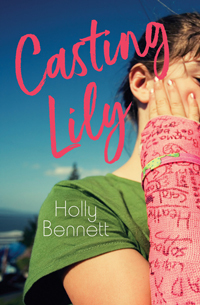 "Casting Lily is more than a story about a play. It is about family, friendship, doing a job well and being authentic. Ava grows as a character, as well as a young person, over the course of the summer…A good read. Highly Recommended." "Bennett has thoroughly researched the process of working with young performers, from the auditions to the warm-ups, the rehearsal schedule and costume challenges, the opening night jitters and emotional reactions to press reviews. For drama students this will be familiar and comforting ground." Aimed at middle-school students with an interest in the performing arts. Topics include music, dance, theater, the circus and magic. See the full list of Orca Limelights.